All sculpture commissions are tailored to client’s taste and location, ensuring a personal statement which is well placed in its new home. Be it a corporate logo turned to stone or a commissioned garden sculpture, any idea or design can be turned into a beautiful work of art. Stone is sourced from all over the world offering a wide choice ensuring the best material is used for each individual project. The aim is to integrate each piece of work with its natural surroundings to create an immediate impression, be it a modern polished sculpture or a more classical aged piece. At the start of each commission, ideas and designs are sketched and discussed with the client before a final design is agreed and produced. 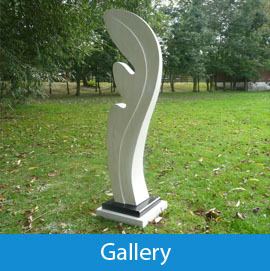 The aim is to integrate each piece of work with its natural surroundings to create an immediate impression. 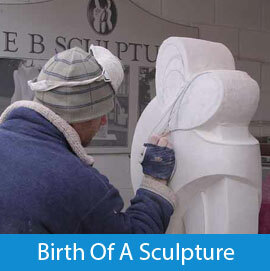 All sculptures are accompanied by a personalised album, showing the “birth” of the sculpture, from block to the finished article. Each piece is carved and worked entirely by hand, creating a unique and special work of art to last a lifetime.